From just an impression in the snow, scientists can now tell a part of a polar bear's story. By teasing out bits of genetic material from a fresh paw print, French researchers partnered with the conservation group WWF have been able to take a snapshot of a polar bear's Arctic lifestyle. "This is the first time we have been able to extract DNA from a track left by a polar bear - we found not only the bear's DNA, but also that of a seal and a seagull," says Eva Bellemain, a researcher at molecular ecology firm Spygen, in a statement. "We know from observations by the WWF team that the bear in question had just killed a seal, and that seagull had been seen at the kill site too, so this one footprint tells the whole story." 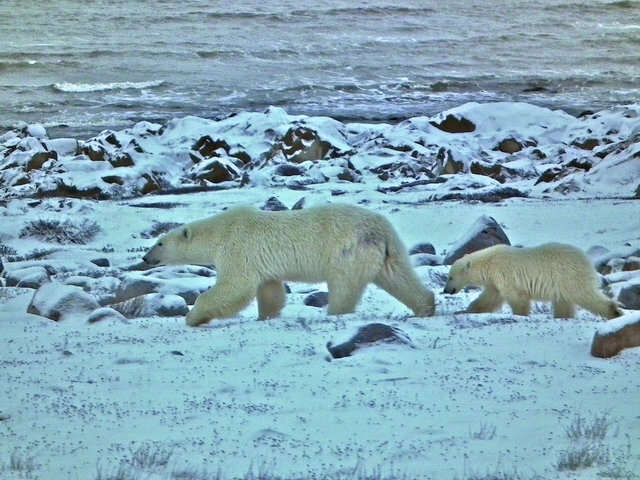 The ability to glean more information about polar bears is critical to the survival of this species, which is threatened by climate change and habitat loss. Listed as "vulnerable" by the International Union for the Conservation of Nature, the polar bear population may decline by more than 30 percent over the next 45 years, the IUCN reports. Monitoring bears as they hunt seals through the ice and snow of their Arctic environment is no simple task. But thanks to technological advances like DNA analysis and satellite tracking, surveying polar bears is now a little bit easier. University of Minnesota biologists recently used a satellite to take a polar bear head count, for example, identifying about a hundred bears in northeastern Canada. The footprint method "would be an invaluable tool for conservation biology," says the WWF's Arnaud Lyet. "At present, researchers use expensive, invasive techniques to track the population size and health of wildlife such as polar bears. Using footprint DNA, we could dramatically cut the investment required, so monitoring populations could be done more easily."